Now that I am on the last leg of my journey in Europe, I have officially been to 4 countries while knowing a local of three. 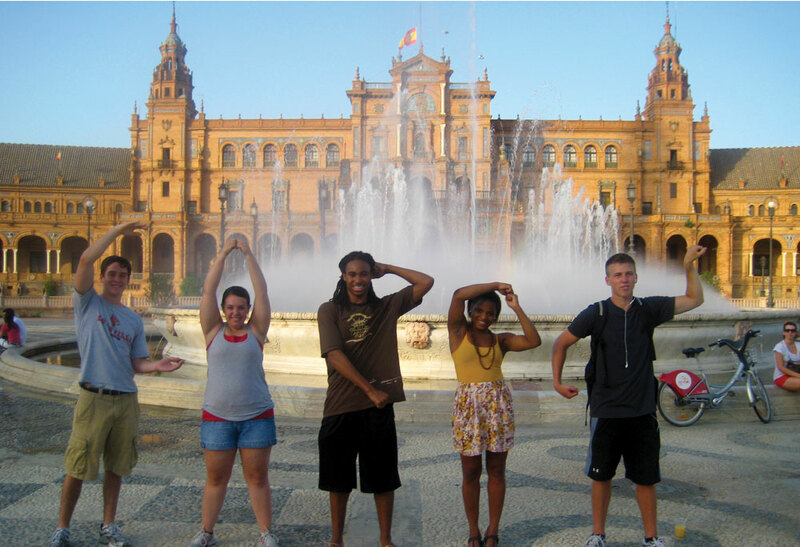 To start my adventure, I spent six weeks studying in Florence, Italy. Lucky me, one of my teammates from school lived a long and treacherous four-and-a-half-minute walk from where I was staying. Not only is it nice to see a familiar face, but you get to truly experience the city… local style. Even if it’s something as small as going to a gelato shop that the tourists don’t go to (and that later becomes your go-to) to going to an Italian style BBQ, use any connections you can while abroad. With the help of my friend, I had the most delicious pizza that I will forever be missing. Next on the agenda, The Czech Republic. Another teammate of mine lived roughly 20 minutes from where I was staying in Prague. This was more beneficial than ever expected. Czech is quite the language not to know considering I couldn’t begin to pronounce any of the words. While I only spent 2 days in Prague, the troubles seem to go away when you are with a native. The people are friendlier and more understanding when you walk around with a local, which really elevated my whole experience in Prague. Onto Amsterdam, I met my mom’s high school bestie for lunch one afternoon and she gave me the low-down on the city. She gave me a list of restaurants that were her favorite, which boat tours make you look not so touristy (but really, are there any that succeed in that? ), and what areas are great for a good look. Overall, travelling to cities where you know someone not only helps you get to see the city from a different perspective, but also gives you a sense of comfort. The first three weeks of my adventure here in Florence were amazing. The people were nice, the food was great, and the weather was ideal with the exception of rain here and there. Having the option to wear jeans in the middle of summer is definitely something I can get used to. However, I think I just got hit by a heat wave and It hit me like a freight train. In the morning I start my day at 8:00. I lift my head up from the foot of the bed because it’s closer to the fan, which keeps me cool at night, and start getting ready for class. Naturally, after walking around for about 30 seconds I start sweating because AC is not a thing here in Florence. This is something I knew I needed to adjust to quickly but also something that’s easier said than done. This small concept is something that I am starting to appreciate more and more and is making me realize Florence isn’t as perfect as I originally thought (but still so close). For now, I am getting used to the fact that to keep cool I need to go get a scoop of gelato or just sit on the couch and use my hand fan, but air conditioning will be quite the welcome home for me. My days abroad are everything I expected and I couldn’t be happier. I wake up at 8 and start getting ready for my 9am. I’m used to going to class in my still-sweaty workout clothes from my 6 am practice and being rushed to my 9:30, so this is a nice change of pace. After putting on real clothes, because Italians never dress down, I start to fix my hair, do my makeup and leave the apartment. On my way to class I stop at a café that has the best chocolate brioche that I have found yet and I try not to scarf it down. About two minutes further on my route to class I found a coffee shop that has American coffee; not as common as you would presume. I get it iced with some sugar and have about five more minutes till I’m at my classroom. 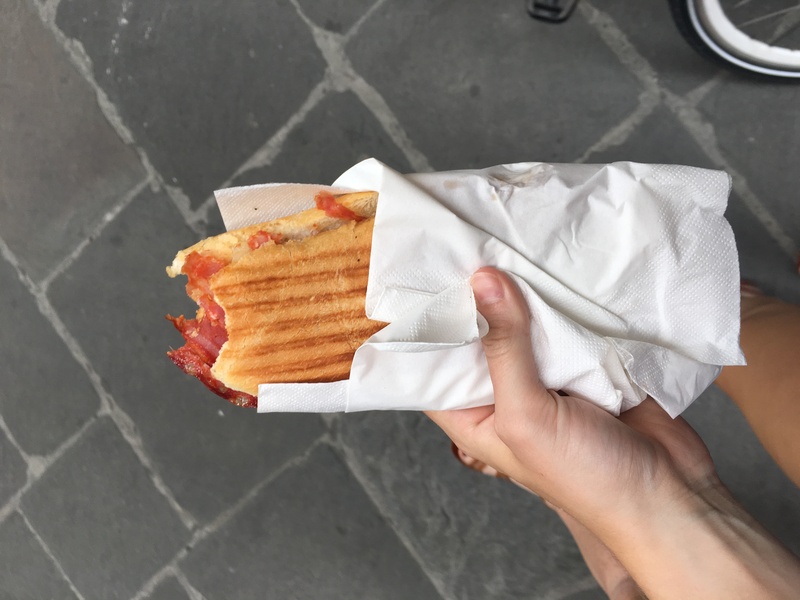 After sitting in my class for two and a half hours, I start my walk back home and grab a panino (panini is plural from what I’ve learned so far) at my favorite panini shop. I try to speak to the owner in Italian and he corrects me every time. I grab my sandwich with spicy salami, eggplant, and pecorino cheese and I am on my way. Once I’m home, I sit on my bed, eat my sandwich and start studying or doing homework if I have some that day. I wait for my roommate to get home and we plan our evening from there. As stereotypical as it sounds, I usually opt for pizza for dinner from my favorite pizza place right around the corner. After pizza, we have to get dessert so we then swing by a gelato shop that is close. I typically get the hazelnut with dark chocolate, and man is it to die for. My day is on Italian time so I’ve grown accustom to being about five minutes late for everything, which really wasn’t that hard for me. Italians move throughout their day at a much slower pace. America is always on the go so being on Italian time has really made me learn to appreciate what I am doing and who I am doing it with. This concept is one that will for sure be a miss when back in the states.